I must apologize for my long absence from the blog. My job has seemingly swallowed me whole recently, but I am coming up for air and with me I am bringing one of our favorite dessert recipes (as a peace offering, of course!). I try to assimilate as many foods in their natural state as possible into our diet. I don’t track percentages like many people who partake in a raw diet do – I just try to use lots of plant based foods like fruits, vegetables, and nuts because they are so good for us, particularly in their natural, uncooked state. I have to admit, though, that I am a frequent victim of salad burnout. This is a good, thing, though, because this blockage against the usual plate of greens and veggies leads to creativity in the kitchen. There are many raw “uncook” books that I particularly like and often look to for inspiration: RAWvolution, Raw food/Real World, and I am Grateful. The recipes in these books are creative, delicious, and most definitely help me to avoid the ever dreaded salad burnout all the while getting my full dose of nutritional goodness from foods in their raw state. My favorite category of raw cuisine is, hands down, dessert (well, that’s true about all food, raw or not …) I mean, I could eat raw dessert all day and be super healthy! I would admittedly have to throw some veggies and greens around in there, but what a nice thought that is: all day desserts. Yum! 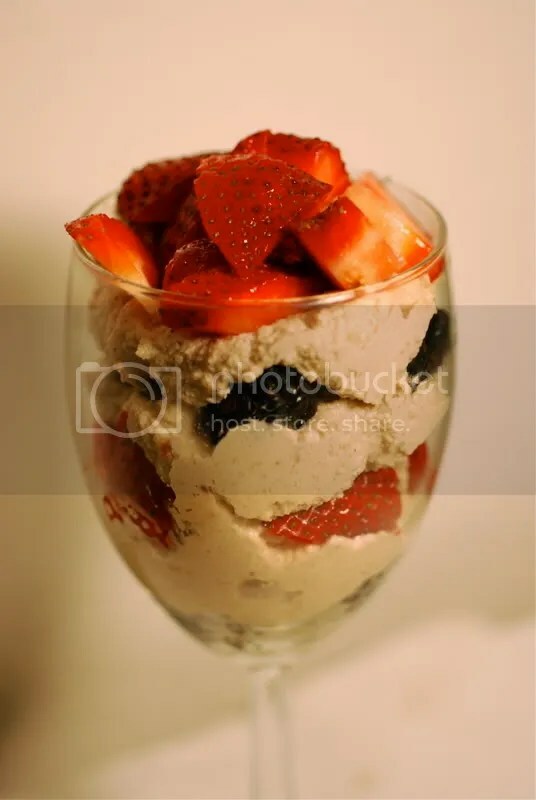 This dessert that I am sharing with you today was heavily inspired by Juliano’s “Whip Cream” recipe, but this is a sweeter version that I like to layer with berries to create an all raw, all delicious, all guilt-free dessert. I’ll even admit to eating this dessert for breakfast and not feeling the least bit bad about it. 1. Soak nuts in water for 2 hours. Drain well. 2. Add all ingredients, except berries, to a food processor and process until smooth. 3. Layer nut mixture and berries in a glass, garnish with a mint leaves (if desired), and serve. This looks so delicious and I think totally guilt free for breakfast.